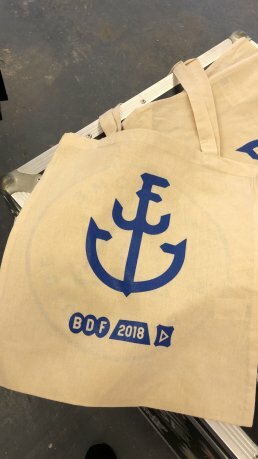 Birmingham Design Festival is a brand new event that took place in June 2018. It’s a four-day event celebrating all things design including disciplines such as Graphic Design, Digital Design, Animation, Architecture and Product Design. 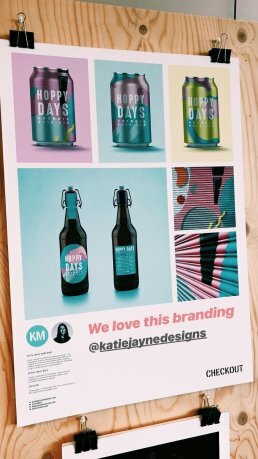 We’ve always wanted to go to a design festival but they are almost always in London and we never get the chance to go, so this was our perfect opportunity. Birmingham has needed an event like this for years, something that brings all local designers and creatives together to engage them in great workshops and design talks from industry professionals. 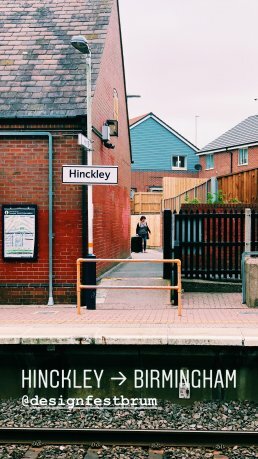 So on Saturday 9 June, 🚃 we made our short journey down to Birmingham to check out the festival. We’d bagged ourselves some tickets for two design lectures at various venues around Birmingham but they weren’t scheduled until later on in the day so first up, we decided to check out the workshops that were happening at Rope Press inside the Jubilee Centre. We arrived at Rope Press and took a look at the nice exhibition laid out by G.F Smith. It featured all of their papers used throughout their history and really emphasised their heritage as paper experts. G.F Smith were also doing letterpress workshops but we didn’t get chance to have a go at one, it looked interesting though. Also in Rope Press were the great folk from Awesome Merchandise! We’ve been avid users of Awesome Merchandise throughout our time in business. (Fun fact, our Robot Pin Badges are made by them. 🤖👌🏼) They were hosting screen printing workshops and we couldn’t resist having a go at printing our own tote bag. We met Jonny, an awesome guy working for an awesome company (so many puns 😁) who talked us through the process and showed us the ropes. Glad you enjoyed it!! Thanks for coming down! 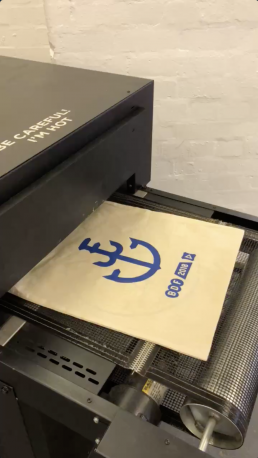 You can see some photos above of us having a go and the completed tote bag! This was a really enjoyable workshop. The guys from Awesome Merchandise were lovely to chat too and we gained some great advice. Next stop, our first design talk at the Birmingham & Midland Institute hosted by the guys at Dixon Baxi. The Birmingham and Midland Institute (BMI) is an educational establishment promoting learning in Birmingham City Centre. Today it plays hosts to arts and science lectures, exhibitions and concerts. During the festival, it was based at the heart of the Graphic District where most of the Graphic Design related activities were taking place. Our first talk was based here in the lecture theatre. It was hosted by two guys from Dixon Baxi, a well-known branding and creative agency based in London. Their lecture was based on the ten principles for creativity. It was a very engaging talk on how they use these principles to create their work and how they collaborate with their clients every day. They also spoke about the superb branding they created for Eurosport and the 2018 Winter Olympics. It was very inspirational, they told us to never fear projects and helped us realise that no matter what challenges we face we’ll always learn from them. So far, we were having a great day! The weather was warm and we loved walking around and seeing everything the festival had to offer. 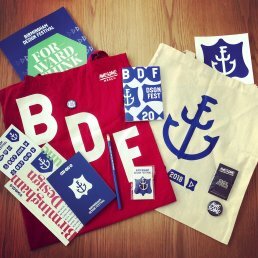 Whilst at the BMI we had a look around the various stalls there and purchased some BDF goodies. 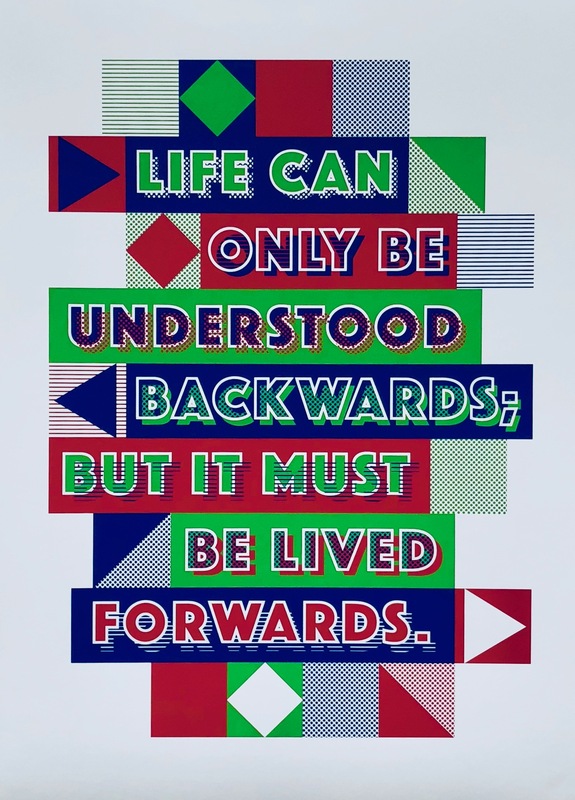 Next up was the Forward Thinking Exhibition based at the Medicine Bakery + Gallery. Medicine is an artisan bakery, cafe and gallery based in Birmingham City Centre. 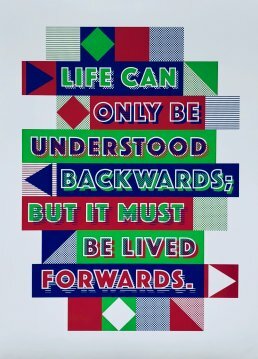 The gallery hosted the Forward Thinking exhibition, a showcase of the design talent in Birmingham and the West Midlands. 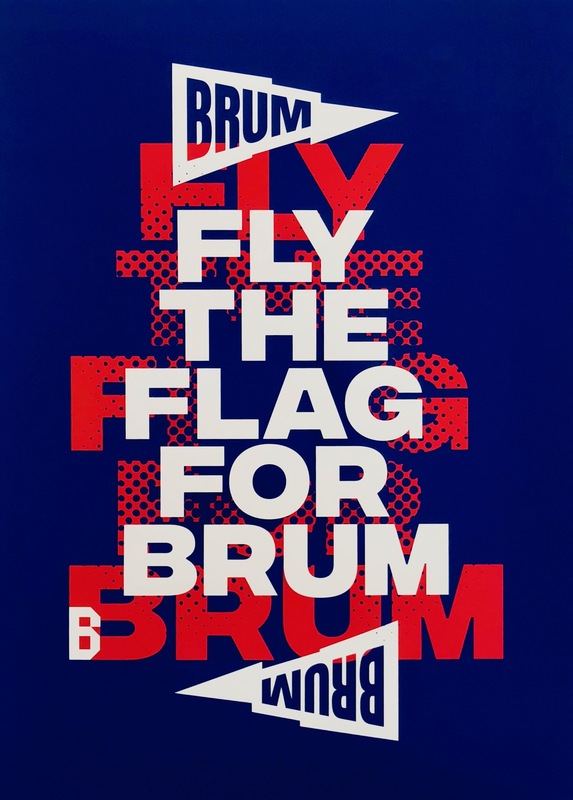 34 designers, artists and illustrators from around the city and the region came together to produce artwork celebrating how design will move forward and shape the future of Birmingham. 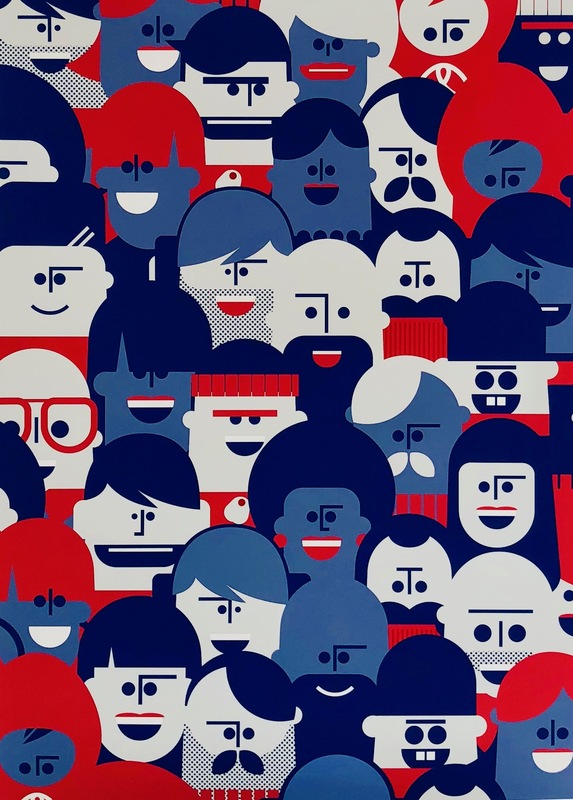 The exhibition consisted of posters created by 34 designers and artists alike. The posters were hung on the walls of the Victorian gallery and it was quite a sight to see. What struck us the most was the bold use of the colours blue, green and red all in keeping with the colours of the festival. 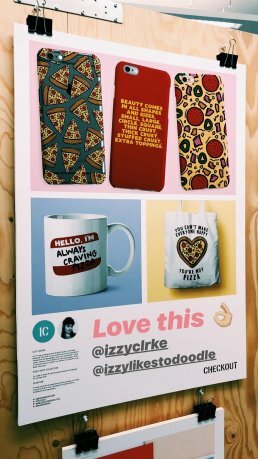 We fell in love with most of the posters so much so we had to purchase a few of them for our office! 😍 We also got the show brochure which featured all of the posters so we could lovingly stare at them whilst having difficult days in the office. Below are just three of the posters we fell in love with! There were so many to see. After viewing this awesome exhibition we made our way over to Birmingham City University to see the designers of the future and their graduate exhibition. Sadly we couldn’t stop for coffee and cake but the bakery looked amazing. Definitely a place to go back to. Birmingham City University is renowned for its creative and visual communication courses. Every year it prepares its students for the big wide world that is the design industry. We went along to see the graduate exhibition to see students work and to pick up some all-important business cards as it’s important for us to engage with the new talent of tomorrow as, let’s face it, we’re not going to be young forever. And so, onto our final design lecture of the day at a place called the STEAMHouse Birmingham. STEAMHouse Birmingham is a unique workspace for innovation and collaboration. Powered by Birmingham City University, the STEAMHouse offers free workshops and events with experts from many different backgrounds. For the Festival it was a part of the Digital District which played host to all things digital and motion related. 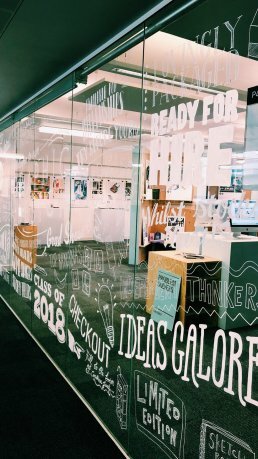 We were here for a talk from Grant Gilbert who is the founder of DBLG, an award-winning creative agency specialising in innovative visual communication, brand design and animation. His talk was based on the concept of creative play and how it can help when building ideas and creative projects. He discussed the importance of having ‘Studio Project’s’ wherein client down-time the studio can be busy working on creative projects for themselves to help keep them motivated and to provide content for their social media channels. This was such a great piece of advice for us as we always struggle to build social media content and we hope that we can produce our own studio projects that can showcase what we do as a creative agency. Of course, DBLG is probably well known more recently for its work on the Channel 4 branding, where it used deconstructed blocks to create break bumpers and on-screen graphics to help give the channel more of a distinctive identity. 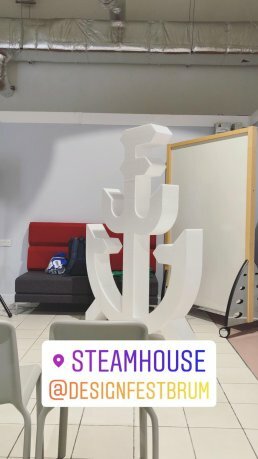 Grant spoke about this project and how it was based on the concept of ‘creative play’ and how they used 3D printed blocks to pitch the concept to Channel 4. They loved it and you can see it all over Channel 4’s broadcasts today. And with that, it was the end of our day at Birmingham Design Festival. ☹️ Sad times, but it was seriously the best office day out we’ve had in ages! We’ve learnt lots of things and saw some incredible work. We can’t wait for next years. We’d like to say a big thanks to the team that worked on making this happen! You guys seriously rock and you’ve really put Birmingham on the design map. It just shows you don’t have to be in London to be at the heart of creativity.